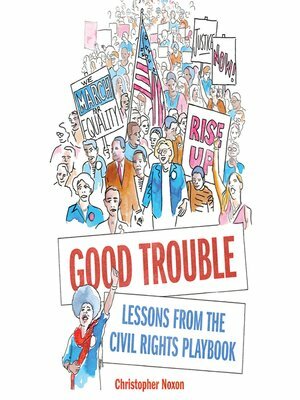 Good Trouble is the helpful antidote to all the pessimism and name-calling that is permeating today's political and social dialogues. Revisiting episodes from the civil rights movement of the 1950s and '60s, it highlights the essential lessons that modern-day activists and the civically minded can extract and embrace in order to move forward and create change. In words and vivid pen-and-watercolor illustrations, journalist Christopher Noxon dives into the real stories behind the front lines of the Montgomery bus boycott and the Greensboro lunch counter sit-ins and notable figures such as Rosa Parks and Bayard Rustin, all while exploring the parallels between the civil rights movement era and the present moment. This thoughtful, fresh approach is sure to inspire conversation, action, and, most importantly, hope. Narrated by the author. Includes a foreword read by Rev. Dr. Otis Moss III of Trinity United Church of Christ, and an interview with the author. Christopher Noxon is a journalist who has written for the New Yorker, the New York Times Magazine, the Atlantic, Los Angeles Magazine, and Salon. He splits his time between Los Angeles and New York City.